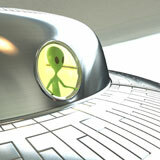 Alien Abduction Lamp: The Truth is On Your Desk | OhGizmo! Wow, I don’t even know where to start with this lamp. Its awesome factor is just out of this world. 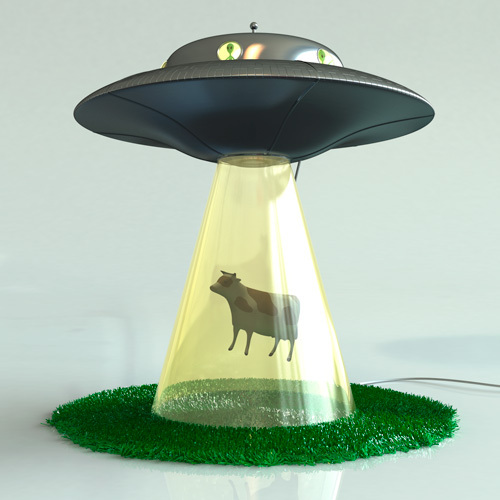 The Alien Abduction Lamp consists of a metal UFO containing the light (complete with an array of alien pilots) which is supported entirely on a frosted glass tractor beam. The cone shaped beam serves to diffuse the light and spread it around, and by turning the intergalactic communication antenna on top of the saucer (also the on/off switch), you can set the light inside the saucer to “pulse” the beam. Why would you want a pulsing beam? Well, how else would you propose to abduct the cow or human who are available as accessories? The Alien Abduction Lamp is only a concept at this stage, but I don’t see how it could possibly fail to be produced for purchase. And if we never hear about it again, it will be for one reason and one reason only: a government conspiracy, man. I don’t just want one, I NEED ONE!!! Thanks to OhGizmo for all the kind words on my lamp! I am currently working to get it produced – or licensed to someone else who can do it. I rented the film to see what you meant. I found the lamp in The Ring 1 (at 00:10:44). Yes, it was shaped like a highly stylized ufo, but all similarities end there. There is no justification in calling my design a ripoff. You know, you could place a tree next to the UFO and run the power cable down in th e tree (have a branch touching the ufo) or run the lamp off LED’s. When you get this lamp produced, please contact us as we would like to offer it in our store. You could embed the power leads in the glass (plastic) cone the way traces are embedded in the plastic overlays inside a keyboard. Take an old keyboard apart to see what I mean. And BTW, I MUST have one of these. Please post some sort of contact info so we can follow your progress and order these when you have them ready! Thats an amazing design you’ve come up with. A bit tacky perhaps… but still stylish enough for the kids room. More a novelty lamp then anything else. looks like a 3d rendering and not real. They are dumb if they don’t produce this haha. that. is. AWESOME!!!!!!! ILL TAKE ONE!!! I just stumbled here while surfing and I must say Lasse I love your UFO lamp and I want one for gifting purposes….is it being produced and up for sale yet? So cool. I love the cow.